This marvelous Japanese lamp stands 6-feet tall and is the perfect way to create an outstanding Japanese design in any room. 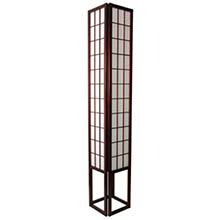 This marvelous Japanese lamp stands 6-feet tall and is the perfect way to create an outstanding Japanese design in any room. A masterful piece of contemporary Asian furniture, this Japanese floor lamp can be placed anywhere for an amazing Japanese decorative effect.